You are here: HomenextPeoplenextLay PeoplenextSurnames beginning with SnextStanton, J.
Mr. J. Stanton has been surrounded by religious influences from earliest recollection. Under the ministry of the Wesleyan Church he learned to love the Saviour and to serve the church in the capacity of local preacher. He was attracted to Primitive Methodism by its “open-air evangel”, and when he removed to Boxmoor in 1894 he joined the Primitive Methodist Society and was placed on the plan of the Berkhamstead Circuit, where he served our Church in the capacity of Local Preacher, Leader and Trustee. 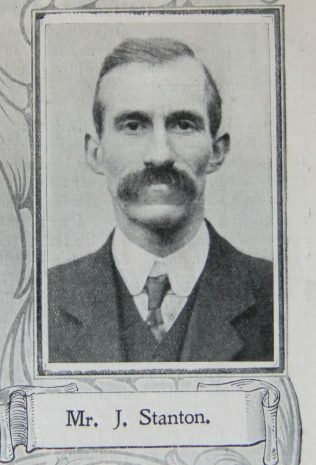 In 1902 he removed to Birmingham, and joined the Society at Lord Street. Two years later he was called to the office of Circuit Steward. He took the office when the Circuit was to all appearance hopelessly insolvent, and he has now the satisfaction of seeing a glimpse of the “silver lining”, the Circuit having gained ground during the last two years. Mr Stanton is a ready and fluent speaker, a devoted servant of his church. He is never absent from official meetings of the Circuit, and regards it an “unpardonable offence” to miss an appointment. Our brother being in the prime of life, we look for great services to the Church through his ministry. I have not been able to identify J Stanton from Census returns. Can anyone point me in the right direction?